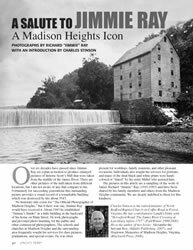 Over six decades have passed since Jimmie Ray set a plan in motion to produce enlarged pictures of historic Scott’s Mill that were taken from the middle of the James River. There are other pictures of the mill taken from different locations, but I am not aware of any that compare to his. Fortunately for succeeding generations this outstanding picture provides a visual record of a remarkable building which was destroyed by fire about 1943. Charles Stinson is the retired minister of North Bedford Baptist Church on Coffee Road in Forest, Virginia. He has contributed to Lynch’s Ferry with “Horseford Road: The James River Crossing at Lynchburg before 1757” (Fall/Winter 1999/2000). He is the author of two books: Alexander the Servant Boy, (Infinity Publishing, 2007), and Hogtown: Memories of Madison Heights, Virginia, (Blackwell Press, 2008).